As Farhan Malik points out in his relatively brief introductory notes to this set, three pianists born in the 1880s became esteemed masters of music by Mozart and the "Three Bs": Wilhelm Backhaus, Artur Schnabel, and Edwin Fischer. (Only Backhaus continued recording into the stereo era.) Of the three, Fischer made the fewest commercial recordings – the most famous of these are his Well-Tempered Clavier discs from 1933-36, a handful of Mozart concertos, and his Beethoven "Emperor" (with Furtwängler) from 1951. Few of those works are duplicated here. In other words, this collection is particularly valuable because it preserves many works that Fischer did not record in the studio. It contains "Public Performances and Broadcasts, 1943-1953," but the earliest selections (Mozart's Fantasy in C minor, K. 475 and Romance in A Flat Major, K. Anh. 205) actually were recorded in Berlin's Electrola Studio in 1941. Fischer was born in Basle in 1886, and he studied in that city and in Berlin. Even at the start of his career, he was a pedagogue; he delayed starting his performing career in earnest until World War One. Throughout much of his life, he was an educator as well as a musician, and he was more than a mere dabbler in conducting too. (In fact, this set preserves his excellent, intense Mozart Symphony #40 recorded in 1953 with the Municipal Orchestra of Strasbourg.) Alfred Brendel is included among his pupils. At his best, Fischer played with a beautifully caressing tone married to a gentle but masculine strength. His interpretations, Romantic in spirit, didn't always remain faithful to the composers' literal intentions, at least as we understand them today, but they consistently uncovered poetry that made him one with the composers' creative spirits. As a result, we don't hear Fischer's playing as particularly "old fashioned." Like many pianists from the first part of the 20th century, Fischer's first priority was communication and expression, and if he took chances and hit a few wrong notes in the process, then that was just an occupational hazard. Today, we have come to expect technical perfection at all times, and musicianship unfortunately has become more sterile as a result. Particularly in these live performances and broadcast recordings, you'll hear mistakes that never would be allowed in today's studio recordings. For the most part, though, you won't hear pianism as strong and magical as Fischer's. This box set presents four different aspects of his career. Fischer the solo performer is represented by the Brahms Variations on an Original Theme, a gratifyingly lyrical choice that opens the very first disc. The other solo works included are Beethoven's Opus 77 Fantasy, Brahms' Third Piano Sonata, and the Mozart works mentioned above. His concerto repertoire is represented by Beethoven (#1, with Fischer himself conducting, and #4 with Fistoulari), Brahms (#2, with Charles Munch's cousin Hans conducting), Mozart (#21, with the pianist conducting), and Bach (the Brandenburg Concerto #2; Keyboard Concertos #2, 4, and 5; the Concerto for Three Keyboards; and the Concerto for Flute, Violin and Keyboard – all with Fischer conducting from the piano). It should be noted that some of the cadenzas heard here are the pianist's own, so Fischer the composer might be said to be present here as well. Fischer was a fine chamber musician, and his partners included Gioconda de Vito, Georg Kulenkampf, and Wolfgang Schneiderhan. Here, he can be heard playing the Mozart Quintet for Piano and Winds with four Swiss colleagues. Finally, Fischer the conductor is heard in the aforementioned Mozart symphony, Wassenaer's (formerly Pergolesi's) Concerto Armonico in F minor, and in an excerpt from Bach's A Musical Offering. 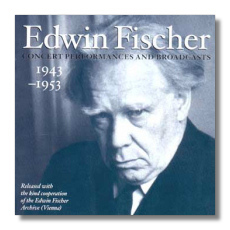 Almost everything included on these six discs is absolutely enjoyable and a credit to Fischer's reputation. Again, perfectionists will squawk about Fischer's occasionally uncooperative fingers, but these people are missing the point. The only truly questionable recording here is that of Brahms' Third Piano Sonata, poorly recorded by RAI, and, technically and interpretively, well below Fischer's usual standards. In recital, he was prone to losses of concentration and memory slips, and the latter is exactly what occurs here. Don't let that scare you away, however. Maggi Payne has done an excellent job with "technical reconstruction" of the source recordings, which have been released here with the cooperation of the Edwin Fischer Archive in Vienna. A sturdy box houses the six discs (in paper envelopes) and the booklet. Note that the booklet and the box omit any mention of the Fifth Brandenburg Concerto on the fifth CD. I imagine this error will be corrected on later copies. Any lingering reservations might be tempered by knowledge that Music & Arts is selling these six discs for the price of four. In short, there's little to complain about here, and much to be wowed by.